I’ve recently finished two new paintings in my In Our Veins series. 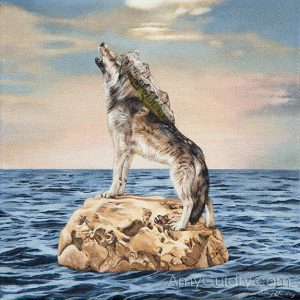 Encroach is an acrylic on canvas, 6″ by 6.” It serves as a subtle commentary on human intervention in nature while illustrating the connection of the natural world to all life. 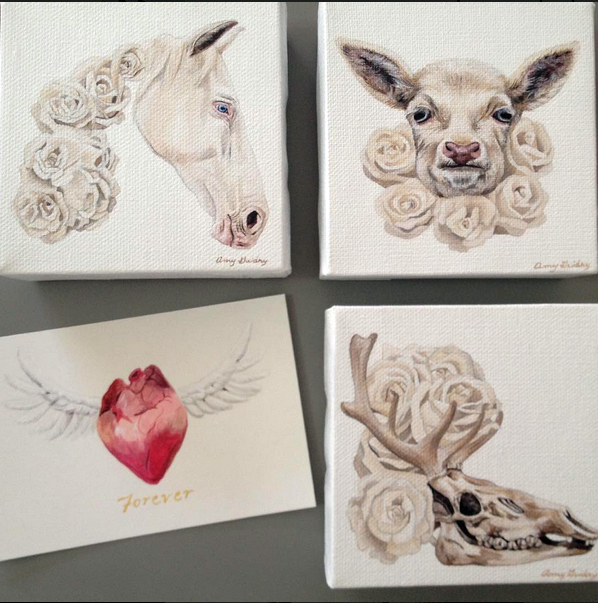 Reciprocal is the latest addition to the smaller series of paintings within In Our Veins. 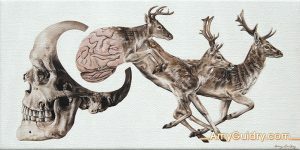 It is also an acrylic on canvas, 4″ by 4.” Reciprocal conveys the connection to nature by linking flora and fauna and uses the ribbon to continue the recent theme exploring anonymity versus connection. 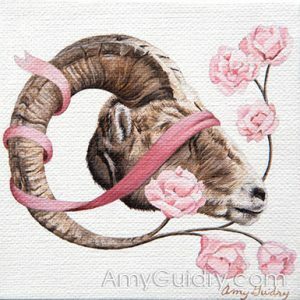 View the paintings online here https://amyguidry.com/encroach.html and here https://amyguidry.com/reciprocal.html. I received some good news recently when I found out Hi-Fructose Magazine has featured my work. Andy Smith writes, “It’s in these works that Guidry seems to highlight the inherent beauty of flora and fauna and the strangeness buried within humanity.” Many paintings from my In Our Veins series are included. 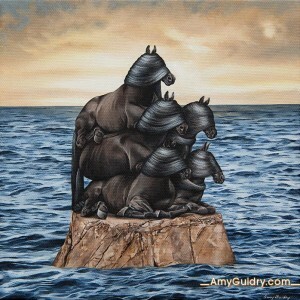 View the entire feature online at: http://hifructose.com/2017/02/15/amy-guidrys-surreal-paintings-touch-on-life-death-and-nature/. I’m happy to announce that my work has been selected for the 2017 Laluzapalooza at La Luz de Jesus Gallery in Los Angeles, California. I’m honored to be among the 64 international artists chosen for this exhibition. The exhibit will run March 3rd through April 2, 2017. Pre-sales are open now online http://laluzdejesus.com/laluzapalooza-2017/ for those that want to get a head start. There will be an Artist Preview on Thursday, March 2nd, 7-10pm and the public opening reception will be on Friday, March 3rd from 8-11pm. Are you thinking of getting roses for Valentine’s Day? Roses wilt but paintings don’t. Art is is more meaningful and gives you something beautiful to look at everyday, forever. So for Valentine’s, buy any painting from me now through February 14th and you’ll receive an original, handmade Valentine such as the one pictured. These paintings featured are all acrylic on canvas, 4″ x 4″ for $100 each. Find them online here: https://amyguidry.com/emergence.html, here: https://amyguidry.com/stem.html, and here: https://amyguidry.com/evanescence.html. Or contact me for details here: https://amyguidry.com/contact.html. 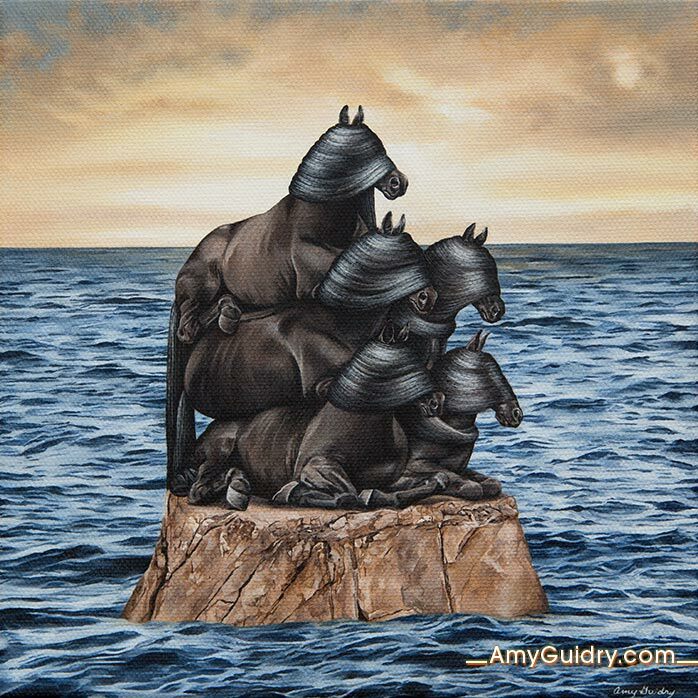 As mentioned before, I will be showing as part of the “Menagerie” group exhibition at the Amelia Center Gallery at Gulf Coast State College. 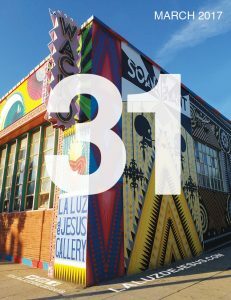 The show’s opening is just around the corner- this Friday, February 3rd, 5-7pm. I’m honored to be among such a great group of artists and their unique approach to animals in art. The exhibit will be on display at at Gulf Coast State College in Panama City, Florida from February 3 – March 3, 2017. Artists featured are: Adam Doyle, Katherine Gallagher, Amy Guidry, Laurie Hogin, Gabriel Lovejoy, Chris Musina, and Kevin Taylor.